The innovation in technology has revolutionized kitchenware and given them a new look altogether. Cookware has gone through a lot of changes, making them more compact sized and user-friendly. Multi-cookers are also one such innovation in kitchenware designs that have empowered users with convenience and reliability. They are one of the most talked about modern cookery items. Multi-cookers have the potential to replace other cooking items since users can both pressure cook as well as slow cook with just one pot. Therefore, it becomes a space saver and people have been attracted to buy this product because of its versatile functionality. So, if you already own a multi-cooker or if you plan to buy one, we have compiled some tips and tricks that will help you make the best use of your multi-cooker. Reading the guidebook is always a good option for any appliance or kitchen item. We recommend you go through the guide, read it and execute the setup of your cooker thoroughly. Fill your cooker with water and make a test run. It will help you familiarize yourself with the operations and controls of the cooker so that you won’t make blunders with the real food inside. Not the best reason for a water test, but test running with water can also clean any germs or dust inside your cooker. One important consideration while working with multi-cookers is that there should always be some liquid inside the container. Especially if you are pressure cooking, the presence of water inside the container is very important. Cooking without water can cause the base of your cooker to burn out. Also, using less water than needed (or no water) means dry and rough food. A common mistake people make while working with cookers is that they tend to overfill the containers. This results in uncooked and dry food because the ingredients are not mixed together well. To get the best results out of your multi-cooker, you should fill it to two-thirds of its maximum capacity. There are markings inside the container that show the quarters, thirds and halves of the container. In case your multi-cooker doesn’t show any marking, try out the following technique to know your container levels. Fill up your container completely with water. Take three equal sized containers and divide the water equally among them. Pour two of the containers back into the cooker. This water level will be two-thirds of your container. Etch out the markings on the walls of the cookers. Pressure release devices are instrumental for pressure cookers. They are indicators as well as release points for extra pressure from inside your container. 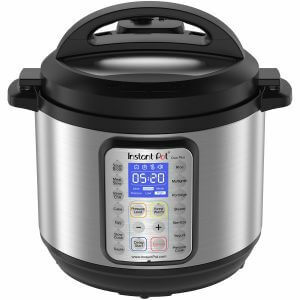 Pressure release devices are a critical element in pressure cookers and directly affect the performance of a pressure cooker. These pressure release devices allow steam and gases to pass through them, so keeping them clean is very important. After every cook, make sure to clean and remove any food particles from the pressure release device with a cloth. This will not only extend the lifetime of the device but also improve the efficiency of your cooker. 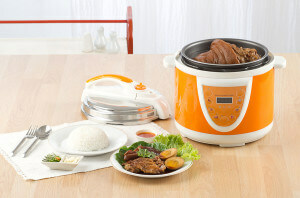 A multi-cooker can be used in slow cook as well as pressure cooking mode. However, the lid provided by the company is the same for both techniques. Therefore, you should buy another lid, and preferably a transparent one. The actual lid is understandably heavier to support pressure cooking, so this lighter lid will be more convenient for slow cooking. Also, you can take off the lid any time during cooking and add ingredients there and then. The lighter lid helps facilitate that. Multi-cookers are a groundbreaking innovation that can potentially replace all your cooking pans and utensils, due to their versatility and efficiency. So, we suggest you go buy a new multi-cooker today if you haven’t already done so. It will add a new dimension to your cooking experience with its amazing user-friendly features and specifications. Make sure to go through the reader’s manual before you start with the recipes.